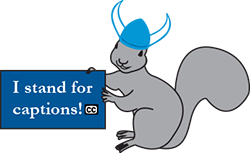 Wally the Accessibility squirrel wants you to come to our Caption Party! AccessibilityConsortium meeting in Old Main 235 immediately following. We’ll do a quick overview of how to make captions on YouTube, and then “crowd source” our caption lesson YouTube video. The more people who come, the fewer minutes of captions each person makes. There will be brownies! Wally knows how important it is to keep your energy up!